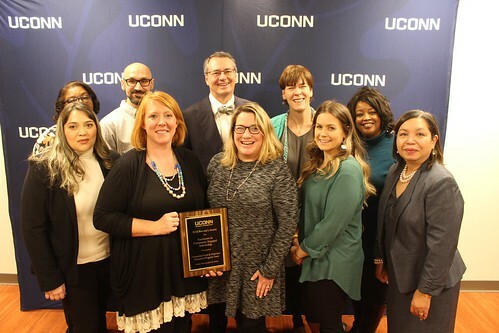 The Expanded Food and Nutrition Education Program (EFNEP) was selected as a recipient of the Provost’s Awards for Excellence in Community Engaged Scholarship in the team category. The EFNEP program, which focuses on low-income families and diverse populations, was honored on December 5. Sustained leadership in working with the public and/or with external organizations. Innovative ways of working for the well-being of citizens and communities. Documented excellence in extending University or community knowledge. Evidence of the impact on a target audience. Team members with a CAHNR Department of Extension or Department of Nutritional Sciences affiliation include: Program Assistant Erica Benvenuti, Program Assistant Educational Outreach Lindsey Brush, Program Assistant Educational Outreach Angela Caldera, Secretary Lorraine Downing, Extension Program Education Liaison Toni Ellis, Associate Cooperative Extension Educator Sharon Gray, Secretary Marlene Kennedy, Visiting Assistant Extension Educator Heather Peracchio, Program Assistant Heather Pease, Assistant Extension Professor Michael Puglisi, Program Aide Juliana Restrepo Marin, Associate Cooperative Extension Educator Umekia Taylor, Program Assistant Educational Outreach Dianisi Torres and Extension Program Education Liaison Zoraida Velazquez. Linda Drake was the program director before her retirement. This entry was posted in Events, Nutrition, Stories.